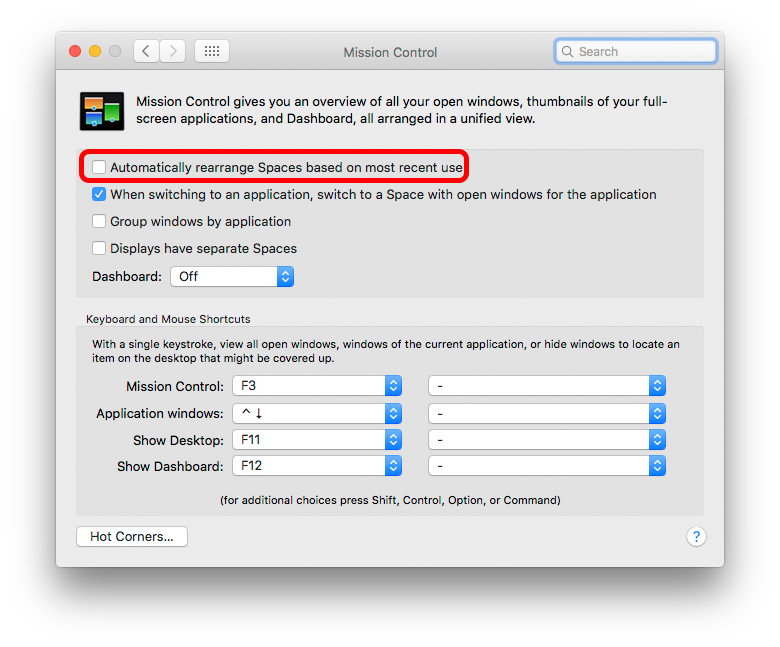 You may have encountered a situation in which Mac changes the order of desktops based on some events like alerts on a program or a web page in browser. How could I disable this logical change? Note: I'm using El Capitan, but I had this problem from Mavericks. Uncheck Automatically rearrange Spaces based on most recent use. This will fix the order of all your regular Spaces - but not Fullscreen spaces, which always go to the right of existing numbered Spaces. From comments: Note this cannot fix the Mac confusing which external screen is which. That's not user-controlled at all, & seems to occur mainly [though not always] when the external screens are identical. Not the answer you're looking for? Browse other questions tagged macos mac spaces . Can I prevent my full screen windows from being mixed around? How to get to know which app causes the “would you like to install java?” dialog in Mavericks to appear?